Every fleet manager should establish a relationship with a roadside assistance provider. The road ahead can be unpredictable, and ensuring your truckers are safe during their travels starts with a good working relationship with your roadside assistance provider. From mechanical troubles to tire replacements, having the right professionals available when you need them can prevent lost profits from accruing when your drivers experience a breakdown. There are many benefits to having a pre-arranged relationship with Service Tire Truck Centers, and our team is dedicated to providing you with an unparalleled road service experience every time. When a trucker from your fleet experiences a breakdown or malfunction en route, finding a reliable roadside assistance provider in the area can be a challenge. Bypass long wait times and unreliable services by choosing an assistance provider today for the unforeseen challenges tomorrow may bring. Setting up your roadside assistance account with STTC will save you time when an emergency arises. Simply call the emergency road service hotline available to take your call 24/7 and provide your account information for invoicing later. In the meantime, we’ll send one of our 250+ quick-response vehicles to your location to assist you. Our goal is to get your fleet back on the road in two hours when tire troubles keep you from getting to your destination. Establishing a relationship with a roadside assistance provider guarantees that you’ll get high-quality service from trained technicians. Partnering with a provider also ensures that coverage is offered on the route where your fleet operates, so you don’t need to worry about service being unavailable due to your driver’s location. When you have a pre-existing relationship, your service provider will know your replacement tire preferences and can make sure your off tire gets retreaded or back to your garage for further inspection. 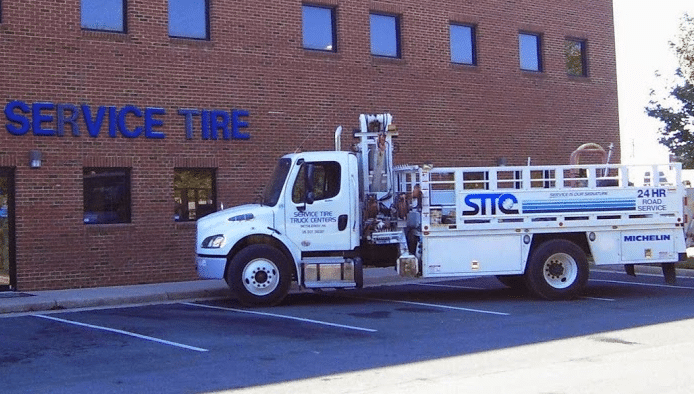 STTC’s TIA-certified tire technicians are available in over 50 truck tire service locations. We even have a Road Assist app [BW1] available for download so you can find the service location nearest you and make your service request in no time. You’ll also receive email notification updates for each event to keep for your records. Keep your fleet going strong with STTC’s expert roadside assistance. Being an effective fleet manager means predicting the needs of your drivers before an emergency situation occurs. The best way to keep your fleet running smoothly and ensure roadside assistance is available when you need it is by partnering with a provider. Contact STTC to set up your account today and get roadside assistance when you need it most.